Follow me on Facebook! Follow me on Twitter! Follow me on Pinterest! Follow me on Instagram! Follow me on YouTube! Follow me on Google Plus! Put your bacon in the oven at 425 degrees and cook for about 15min (You don’t want the bacon all the way cooked because it’ll cook more when you put it in the fryer!). Let cool and then cut into little pieces and set aside. Cook the macaroni according to the instructions on the box. Also set aside for the moment. In a saucepan, melt your butter. Once the butter is melted, mix in the flour making sure there are no lumps. Add the milk (Make sure not to wait too long, or else that butter might burn!) and cook on medium heat for about 4 minutes until the sauce thickens. Remove the sauce from the heat and mix in all the cheese. Immediately fold in cooked macaroni and bacon, and season with salt and pepper. Chill in the refrigerator for two hours. Now shape the cold macaroni and cheese into balls. These weren’t as big as Cheesecake Factory’s cheese balls, just a little smaller, but not bite sized. You can make them any size you want though! Place the formed balls into the freezer for an hour or so. Take them out of the freezer and compress them into even tighter balls and put them back in the freezer for another 45 min or so. Set up three bowls.In the first bowl, combine the flour, salt, black pepper, cayenne pepper, paprika, and sugar.In the second bowl, whisk together the eggs and milk.In the third bowl, put in a pile of Panko. Heat up your oil in your deep fryer (I use this one) or large, deep skillet. Roll each ball in the flour mixture, then the egg mixture, and finally the Panko. Drop each ball in the fryer until lightly golden brown. Remove balls from fryer and let dry on a paper towel to drain off excess oil. Please tag @cookingwithjanica and use #cookingwithjanica on social media. We'd love to see! 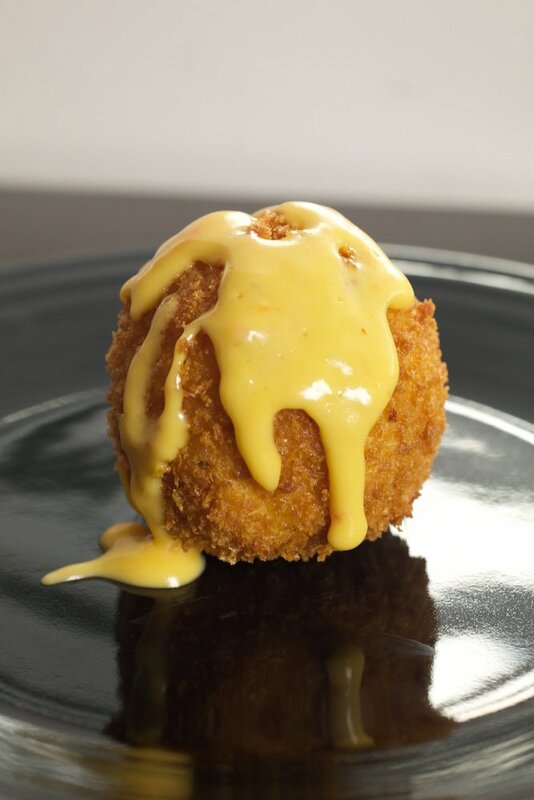 ***I think all fried macaroni and cheese balls should have some sort of sauce going on. Here’s a recipe for a Spicy Pimento Sauce I found on someoneleftthecakeoutintherain.wordpress.com. (I also used this recipes flour and spices mixture to roll my macaroni balls in before frying). I could only find a 7 ounce container of pimento cheese though and I added a little more Sriracha to give it more of a kick! Melt butter in a saucepan over medium low heat. Add the heavy cream and let simmer for 5 min. Then whisk in garlic, parmesan, pimento spread, and Sriracha. 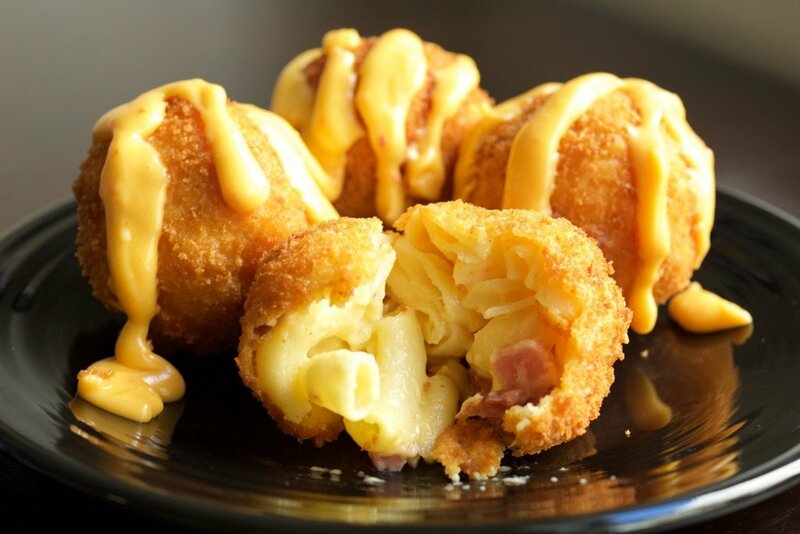 Pour over your fried macaroni and cheese balls and never look back! It’s awesome to come across a blog every once in a while that isn’t the same unwanted rehashed information. Fantastic read!